On Saturday 10 June we were delighted to support York Pride - for the fourth year in a row. Members of the public signed 200 postcards in support of people around the world who face discrimination (or persecution) for their sexual orientation or gender identity. 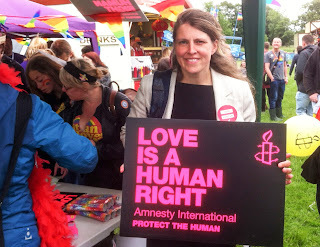 Rachael Maskell (who was re-elected two days earlier as Member of Parliament for the York Central constituency and spent a lot of time at the stall) lent her support with the message "Love is a human right". One of the aims of Amnesty International's "I Welcome" campaign is changing the tone of discussion around refugees. 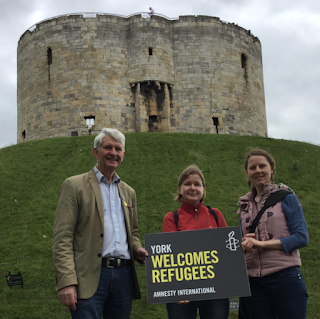 On 24 June, at the end of Refugee Week 2017, three members of our group came together at Clifford's Tower in York - with the message "York welcomes refugees". At the same time, fourteen other Amnesty International local groups around Yorkshire and the North-East of England took photos with similar messages at their own local landmarks. Graham Minter of Amnesty International UK's South America team is the guest speaker at our monthly meeting this month at the usual venue - the Friends Meeting House, Friargate, York YO1 9RL. It takes place on Tuesday 11 July, starts at 7 p.m. with Graham's talk followed by questions and answers and then continues (from 8 p.m.) with our group's regular business. All are welcome to attend and, if they like, to leave after Graham's talk.